I’ve got a little salad inspiration for you today. This is so simple, but oh so delicious! I love it when you can create a symphony of flavors with less than a handful of ingredients. The other night my husband and I were feeling super lazy, but were in the mood for a light dinner. 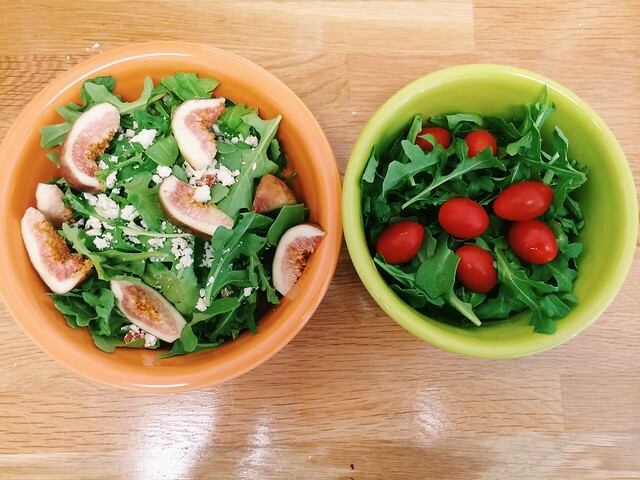 Combing our fridge, I ended up throwing together these his-and-hers arugula salads. Mine had some figs and feta cheese, his contained grape tomatoes. Both were dressed with some creamy caesar romano dressing from Trader Joe’s. Two simple summer salads in two minutes! hey dear. its me sandy with sandyrellamidnight :D i love it when you can toss anything together and make something simple out of it. what kind of dressing do you like?